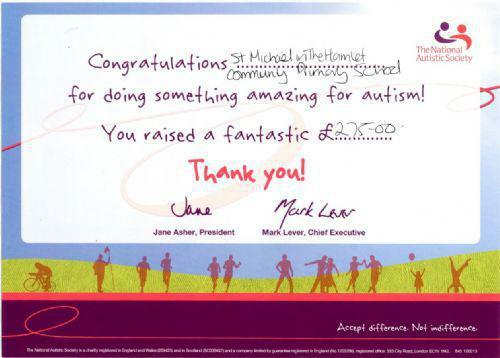 Below is a copy of the thank-you letter our school received from The National Autistic Society thanking everyone for taking part in the fund-raising event. Further down is a scan of the certificate our school received. On behalf of everyone at The National Autistic Society thank you so much for taking part in 'Onesie Wednesday' for World Autism Awareness Day! Your fund-raising and wonderful donation of £275.00 will help us to continue supporting those affected by autism and I can't thank you enough for you amazing support. I hope everyone involved in your fund-raising activity had a fabulous time. The National Autistic Society is the leading charity for people affected by autism. Over 1 in 100 people in the UK have autism. Together with their families they make up over 2.7 million people whose lives are touched by autism every single day. It is only because of generous people like you that we are able to improve the lives of those touched by autism. Your support enables us to deliver vital services for even more people with autism and families as well as raise much needed awareness within local communities. We provide a range of services from early school age through the transition into teenage years, on through student support/employment services and into adult provision services. These services are a life line to many people affected by autism. If you require any further information or would be interested in supporting our work further please do not hesitate to contact us at supportercare@nas.org.uk or call 0808 800 1050 and a member of our team will be happy to help you. Once again an enormous thank you from all of us at The National Autistic Society, you are amazing!